It is hard to imagine, from an American experience, schools or communities without books and libraries for children. But it is a reality for many language communities and schools in other parts of the world, including the schools involved in USAID/Uganda School Health and Reading Program (SHRP) project in Uganda. In March the project held a Reading Competition in the Gumba district. Twenty-seven schools came together to celebrate reading in the local language and to engage the community in encouraging students’ reading. 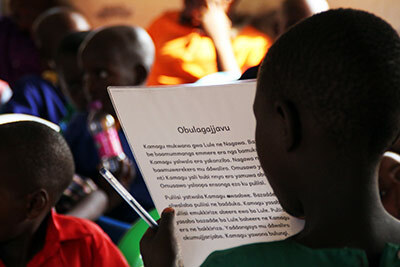 This event was organized to boost interest among children and parents in education and mother tongue literacy. This reading competition not only brought a community together to celebrate reading and provide books, but it was appreciated by the District Education Officers who are now encouraging schools to organize more of these, in classes, to build confidence among learners and provide creative outlets for them to practice their reading skills. The event is also helpful for the teachers to evaluate their students. Charity Baguma, the event organizer, reported that the event “communicated that some children still had fear of talking in front of the groups, others couldn't read a word; while other schools were putting books to excellent use, and this was evident in the reading skills of their learners. On this occasion of World Book and Copyright Day, an annual event organized by UNESCO, take time to appreciate the many different worlds, experiences and people that are available through words crafted to fuel imaginations and impart knowledge. Encourage your children to read and appreciate books in a new way because it is a privilege. Our goal is to help more language communities to have this same access to books through the support of projects like SHRP.